Not our normal Saturday racing, but a successful day with "Itz a Bullet" winning a the class 2 1550m and "Kifaah" running second in the cup at Pooncarie NSW Thanks to Dylan Caboche for heading up to take both of the rides for the stable. Congratulations to the connections of Itz a Bullet for winning Race 1 on Gawler Cup Day today. A great ride from Paul Gatt got the ever consistent 3yo, son of Bullet Train, to a 0.6L win in the Volkswagen Arteon Launch / Sabios Madien Plate over 1700m. Finally, we have what you have been waiting for! Core Breach - 4 in a row! Itz Invincible came out second up this prep to take out his first city win at Morphetville in the "Happy 90th Birthday Doug Brown Handicap" over 1100 metres. Well ridden by Dylan Caboche the duo finished infront by 1L in a time of 1:05.03. 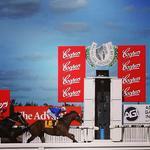 Itz Invincible made a successful return to the track at Balaklava in the Argoweld Class Two Handicap over 1050m. Ridden by Paul Gatt, and carrying a hefty 60kg fought it out to win by a length.